Z for Zambia. The culmination of our world tour is here in this southern African, land locked country, Zambia!! I hope this world tour offered a glimpse into the various cuisines of the world. After cris-crossing the world, lets settle down with a homey kind of a curry which is a staple in Zambia. Apparently, this curry is usually accompanied by a dish called Nshima. It is a corn flour, cooked in water and shaped like torpedos (oval shape) and they form a very important part of their meal. Since I was not sure we could appreciate it, I went ahead and served it with rice and roti! Stay tuned for a round up of the tour in the next post! In a heated pan, add oil and saute the onions until they are golden brown. Add the chopped tomato or tomato paste with some water. Let the mixture cook for a couple of minutes. Add in the peanuts, spinach and pumpkin. Cover and let it cook for about 6-7 minutes. Check for the done-ness of the pumpkin and add salt and pepper as needed. Let the mixture simmer for a few more minutes until there is no moisture left. Remove and serve it hot/warm with rice or roti. Check out the Blogging Marathon page for the other Blogging Marathoners doing BM# 44. Y for Yemen. It is an Arab country in the south western area of the Arabian peninsula. Regarding their cuisine, it is distinctly different from the typical Middle Eastern Cuisines. Rose water lemonade is one of the popular beverages there. Mix all the ingredients in a container and adjust the flavors as needed. Serve with ice and a lime/lemon slice on a hot day. X for Xinjiang. Since there is no country which starts with X, we built in an exception to pick out an area/city/territory starting with X, which is famous for its cuisine. So I zeroed in on Xinjiang province, China. Xinjiang is primarily a Muslim dominated region and their cuisine is influenced by the Central Asian and Turkish Cuisines. The natives there are mostly from the Uighur group. And this particular salad is a street food very popular in the streets of Kashgar. The food of the Uighurs happens to be a tasty and diverse introduction to Chinese Cuisine! This salad was a tasty success with my husband who is fond of Chinese cuisine. I had only a cup of soaked, boiled chickpeas and he wanted a repeat of the same salad. So I made it with steamed sprouted mung beans which he loved just as much. The key is the sauce/dressing used. Mix all the ingredients of the dressing in a glass bowl and microwave it for a few seconds so the honey can blend in. Whisk the dressing well and serve immediately. Drain the boiled chickpeas and arrange them in a serving plate. Sprinkle the grated carrots and chopped coriander leaves. Drizzle the dressing as needed and serve. W for West Bank. It is a land locked territory wedged between Israel, Jordan and the Dead sea. It has been a conflict ridden area for more than 50 years now. But it is very interesting to note that in spite of the conflict, development and education have not taken a back seat. Regarding this addictive Brittle, it is supposed be a favorite snack for kids and adults alike and our family totally agrees. I found it tastes better with honey instead of the traditional jaggery/sugar syrup which we make back home. Dry roast the sesame seeds on medium heat until they turn a shade of brown and start to crackle. Reduce the heat to low and drizzle the honey. Remove from heat and mix well so all the seeds are coated with honey. Transfer onto a greased plate or parchment lined cookie tray. The mixture will be sticky, so don't attempt to smooth it. Set aside for 2-3 minutes. Pat into a thin layer pushing in the stray seeds with your fingers. Smooth the top and let it cool for about 10 minutes. Slice into required shapes with a strong knife and enjoy. V for Venezuela. Venezuela is one of the most urbanized countries in Latin America. The population is very diverse and the majority of the population is of a mixed heritage. 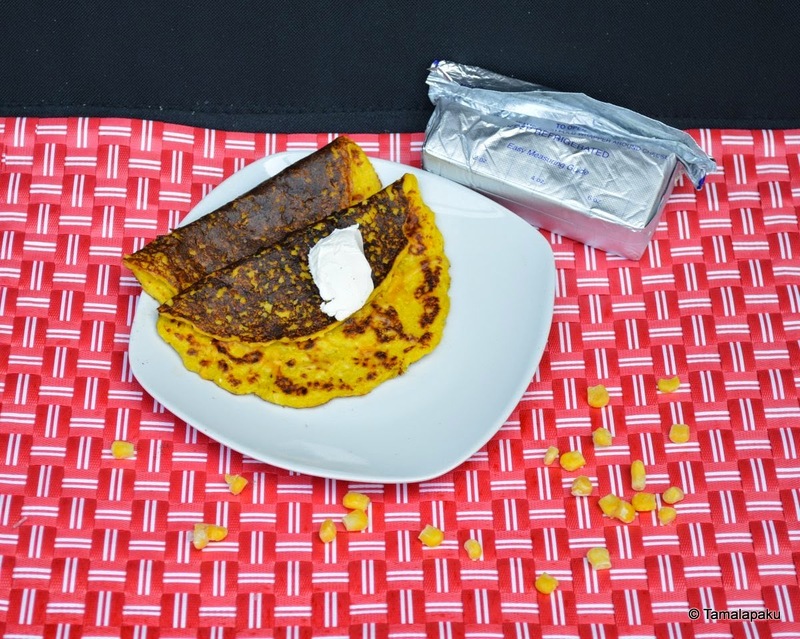 Coming to today's recipe, Cachapas, it is a traditional Venezuelan breakfast. It is a very popular street food as well. There are very many variations to it. But this version was closer to our palates and was also popular at home. Blend the thawed corn along with cornstarch, salt and milk to make a coarse batter. It should be slightly thicker than pancake batter consistency. Heat a griddle/tawa. Pour a ladle full batter and spread like an Uthappam. Cook on a low flame until the underside is cooked. Gently flip onto the other side and cook for a couple minutes. 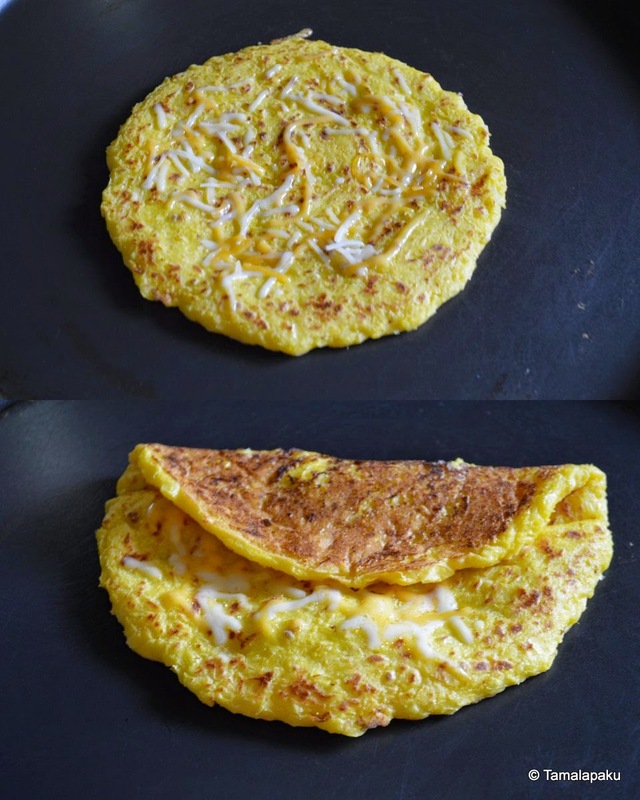 Flip again and sprinkle cheese, fold and remove onto a serving plate. Continue with the rest of the batter. Serve these Cachapas warm with butter or cream cheese for a filling breakfast. Linking this to Srivalli's 'Breakfast Event'. U for United Kingdom. I don't think UK needs any introduction. Once upon a time, I had a dream to go on the time machine and visit London during the 1800s. Subsequently, I used to read some Historical fiction set during that time period. I used to read up on any historical fiction/non fiction books which depicted the lifestyle of Britishers during that era, be it in India or in England. I used to watch movies set in that time period as well. In those narratives, there used to be a reference to Bread and Butter Pudding and since then I wondered how it would taste but never did I imagine that I would be a food blogger and that I would try this out!! I made this twice (back to back in two days) to satisfy the cravings of my older one and mine too!! Remove the crusts of the bread slices and butter them on one side. Cut the slices into 2 triangles each and layer them in a rectangular baking dish which has been greased well. Sprinkle the raisins, and other dried fruits and arrange the bread slices evenly. Sprinkle cinnamon and nutmeg and set aside. To prepare the custard, heat milk and add sugar. Separately mix 2 tablespoons of milk with custard powder and gently pour into the boiling milk. Pour the prepared custard mixture onto the layered bread slices. Set aside for a few minutes. Preheat the oven to 350 °F. Bake the bread slices for about 40-45 minutes until the custard sets properly and the tops brown. Serve warm or cold as per your preference. T for Turkey. Turkey has a unique distinction of belonging to two continents, Asia and Europe. "Turkish cuisine is largely the heritage of Ottoman cuisine, which can be described as a fusion and refinement of Central Asian, Caucasian, Middle Eastern, Mediterranean and Balkan cuisines" says wiki. These spinach tortilla rolls fall into the fusion category of their cooking. 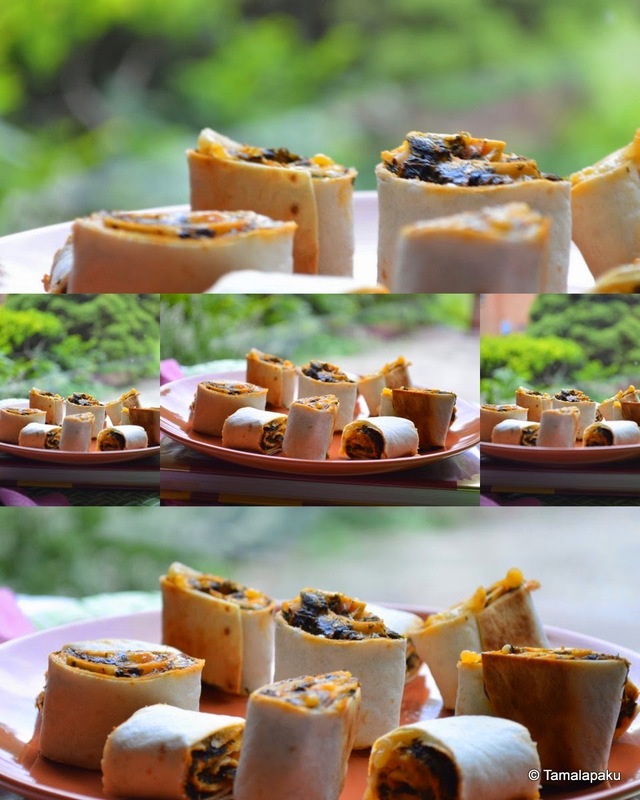 Borek is a family of salty pastries made using a thicker form of phyllo dough. Here a spinach filling along with cheese is rolled into a tortilla, sliced and baked until crisp to make a fantastic snack. It is a very addictive, healthy and filling meal. My family has hooked onto this snack and so it ranks very high in the list of after school snacks!! Cook the thawed spinach separately and set aside. In a heated pan, add oil and saute the onions until golden brown. Add tomato paste and a few drops of water so they blend well. Add paprika or red chilli powder as needed. Mix in the cooked spinach and sprinkle salt as needed. Mix well and remove from heat. Preheat the oven to 425 °F. Spread the filling evenly all over the tortilla, sprinkle cheese as needed. Roll the tortilla like a carpet. Slice 1 inch pieces and arrange on a parchment lined baking tray. Bake for 10 min until the cheese melts and the tortillas crisp up. Remove and serve them immediately. S for Spain. In our last leg of this tour around the world, we land in Spain. It is supposed to be a very beautiful country and this according Wiki.."The climate of Spain, its geographic location, popular coastlines, diverse landscapes, historical legacy, vibrant culture and excellent infrastructure, has made Spain's international tourist industry among the largest in the world." Ajo Blonco is a very popular cold soup in Spain. For a creamier version, milk can be added instead of water. We felt it had the taste of buttermilk. I guess that is because of the addition of vinegar. It is a good choice for a hot summer day. Unfortunately I had to make this on a cold, windy and rainy day ! *For Garnish - Toasted almond slivers, parsley, grapes and watermelon. Trim the crust off of the bread slices. Soak the trimmed bread slices in water for a few minutes. Add in the blanched almonds, soaked bread slices, garlic, water, olive oil, apple cider vinegar and salt into a blender. Blend until smooth. Adjust the consistency as needed by adding in more water. Serve it in bowls with toasted almonds and other garnishes as available. R for Russia. This soup is the first in this series which was prepared. Russia is the largest nation in the world. It has a great culinary diversity owing to various ethnic groups. Check out this soup or Borcht as it is known as, and enjoy the goodness of various vegetables! In a stock pot, heat oil and saute the onions, add the rest of the vegetables, garlic and vegetable stock. Cover and let it simmer until the vegetables are cooked well. Blend well (using an immersion blender) and mix in the apple cider vinegar. Adjust the taste by adding salt and pepper. Serve it hot with sour cream as a garnish and we enjoyed with a side of croutons! Q for Qatar. Qatar is an Arab nation which is the world's richest nation per capita. Since Qatar has a long coastline with the Persian Gulf, majority of their food is sea food. But the desserts from the typical Arabian cuisine are so delectable and addictive. Khabees is one such very popular dessert (If I am not wrong, they consume this for the early morning meal during Ramadan) with the Qataris and is consumed during the holy month of Ramadan. An interesting tidbit about khabees is that there is a mention of this dessert in the story series of The Arabian Nights. My husband who is an avid story teller found this very amusing!! Our kids look forward to the dinner time stories narrated by my husband and he relies on the so many story books and series we have read in our childhood (and still read)!! I have found various versions of Khabees using flour, sugar and nuts but there is a mention of the ingredients for the Qatari version here and found a video in Arabic as well. I thought I should have shaped them like laddu but it was gone before I could do that!! So check out this addictive dessert. In a pan, heat ghee, fry the coarsely chopped nuts and dates. Add in the semolina and fry until it turns light brown. Sprinkle cardamom powder and mix well. Remove from heat and pour in the honey. Mix well until the mixture is not powdery. Shape them as preferred, garnish with chopped nuts and serve warm. Keep in mind that the mixture would harden upon cooling and so it is a better idea to shape them while it is still warm. P for Poland. After lot of searching I zeroed in on these filling pierogis and kicked myself as to why I couldn't get to it sooner. It so happens that one of my friends and neighbor is half Polish and she had sent over some frozen pierogis for Christmas last year. Unfortunately, it was lying in the far recesses of the freezer and was not used up in time. So when I came upon pierogis I thought I should at least try them and see if we like it. Though the process was time consuming, I think it was worth the time and effort as the kids loved these. Mix the flour, salt, oil and warm water and knead to get a soft and pliable dough. Cover and set aside. Boil / steam the potatoes. Mash and set aside. In a pan, heat oil and saute onions until they are golden brown in color. Reduce the heat, add in the mashed potato, sprinkle salt and pepper and mix well. Remove from heat and allow it to cool. Divide the dough into manageable size portions. Roll out each portion on a well floured surface into a thin sheet. Using a cookie cutter or a sharp top glass to make 3 inch circles of the wrappers. On each of the small rolled out wrappers, place a teaspoon of the filling, apply water to the edges and seal it into a semi circular shape. Continue until the dough is done. they are done. I had to do this in two batches. But it depends on the size of the stockpot. Some love their pierogis just boiled. But if you are like me, please go ahead and shallow fry them until they are lightly crisp. Serve it with any spicy/tangy dip for a filling snack! I served with a spicy yogurt based dip (Raita). O for Oman. Oman is an Arab nation which holds a strategic position at the mouth of the Persian Gulf. Here is a delightful dessert/snack from Oman which will win your heart. It is not overly sweet but addictive for sure. In a mixing bowl, add the flour, baking powder and cardamom powder and mix well. Add the condensed milk and warm water and mix well to make a sticky dough. Cling wrap it and set aside for 2 hours. Flour your hands and pinch apple sized dough and roll into a 2-3 cm inch rectangle. Using a pizza cutter or a knife, make small triangles or any other shape of your preference. Heat oil and on medium heat , gently slide these dough pieces and let them evenly brown. Remove onto paper towels to drain excess oil. Sprinkle Pistachio powder or powdered sugar as a garnish and serve them warm. N for Nigeria. Nigeria is a west African nation which is known as the 'Giant of Africa'. It is the most populous country in Africa. Nigerian cuisine is known for its variety and richness. These cornmeal fingers are a very popular street food in Nigeria. They were just as popular at home :). In a mixing bowl, add the cornmeal, salt, red chilli powder and grated ginger. In a sauce pan, heat water. After the water comes to a rolling boil, slowly add the cornmeal mixture while stirring continuously. Stir until the water is totally absorbed. Sprinkle 2 tablespoon of water, cover and remove from heat. Heat oil in a wok/kadai. Pinch lime sized dough and roll them into long fingers. I made them into 1 inch fingers. Slide a few into the hot oil making sure there is enough space to accommodate all the fingers. Fry until they are all evenly cooked. Serve it as a tea-time snack.